This illustration shows the gas density in a simulated galaxy at about 1 billion years after the Big Bang (redshift 6) with properties similar to those of the galaxies in a Hubble Space Telescope study released today. This includes an efficient rate of turning gas into stars. 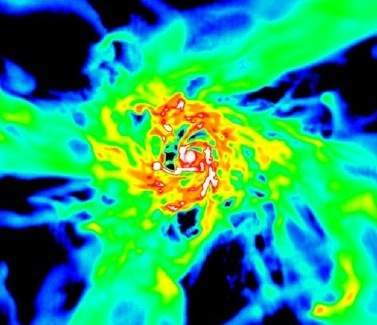 The simulated galaxy is being fed by streams of cold gas (green and yellow) flowing in along filaments from the cosmic web. This fuels the star formation occurring in the regions with the densest gas in this galaxy (red and white), mostly in the galaxy's center but also in clumps around it. The gas in this galaxy has shrunk to a compact, star-forming "blue nugget" with a violently unstable, clumpy disk.